If you notice that you are not getting updated events in mXrap, there are a few possible explanations. In order to troubleshoot the problem, it is good to know exactly how your events are transferred from your seismic database, into mXrap. The first thing to check is if the events are just being filtered out. In the events table, there is a “Show All Rows” option that will disable all filters and show you every event in the database. Sort by descending time and “Reload Data” and check the latest event time. Cross-check with your seismic processing software to confirm you are definitely missing events. Remember there is a short delay (~ 5 mins) from events being recorded to appearing in mXrap. If showing all rows unveils your missing events, it’s a filtering issue. Look through the event filters to make sure everything is turned off. It might also be the quality filter. To see what quality settings are applied at your site, refer to the “Event Quality Settings” video here. If you have confirmed the events are not updating, go to your root folder and open the #Events Import folder. Inside there will be an all_events and a recent_events evp file (exact folder, name, extension varies slightly between sites). These are the event files that are read by mXrap. Check the time-stamp of the recent_events file, it normally updates within 5 minutes of the latest event recorded. Try opening the file using notepad, it will be sorted by time so check what the latest event is. If the EVP files in the root folder have the updated events, mXrap is not reading the files correctly. Contact support@mxrap.com for assistance. EVP files are generated by querying the seismic event database. The recent_events evp is normally updated every 5 minutes and contains the events from the start of the previous month, up to the present. The all_events evp is normally updated every 24 hours and contains all events up until the start of the current month. So there is always up to one month of overlapping events between the all_events and recent_events EVP’s. The EVP file only changes if there is something to change, i.e. the all_events EVP may be checked for updates every 24 hours, but the file may not have any changes for several days or weeks if none of the processing has changed. If the evp files in the root folder have not been updated, the problem lies in how these files are copied into the root folder from your seismic database. This process varies by site, depending on whether you use IMS or ESG as your seismic service provider. IMS generate the all_events and recent_events EVP files and normally store them on the seismic server share drive (often a Linux samba drive). Hitting “Reload Data” in mXrap will copy those EVP files (if they’ve changed) into the #Events Import folder in the root. You need to specify the location of the EVP files on the network. This setting is in the “Config Events Import” app, usually at the top of the app list (log in as Admin or Super User). In this app you should see the file paths to the all_events and recent_events files. Make sure these file paths are correct and try navigating to the files in windows explorer. If you can’t access the files through windows explorer, you will need to ask your IT department for help to get access to the network location. There might also be a password required. If you are able to access the EVP files on the seismic server, again, check the timestamps and open the recent_events file to see what the latest event is. If these files are up-to-date, it is a problem with the copy-action from the seismic server to the root. Double check the file path in mXrap is correct and try to “Reload Data” again. Contact support@mxrap.com for assistance if mXrap events are still not updated. If the EVP files on the seismic server are not updated, it is a problem with the IMS query and you will need to contact IMS for assistance. We have a purpose built program for querying the ESG seismic database and dumping the EVP files into the root folder. The mXrap Export ESG program normally runs on the ESG computer. Check that this is still running. There should be an icon in the system tray. The ESG Exporter needs to know the location of the seismic database .mdb file and the location of the #Events Import folder in the root. Try manually running the query from the Exporter window and look for error messages and report to support@mxrap.com. Common problems are not being able to write files in the root folder (user permissions), ESG Exporter is out-of-date, or the seismic database .mdb has moved or changed format. 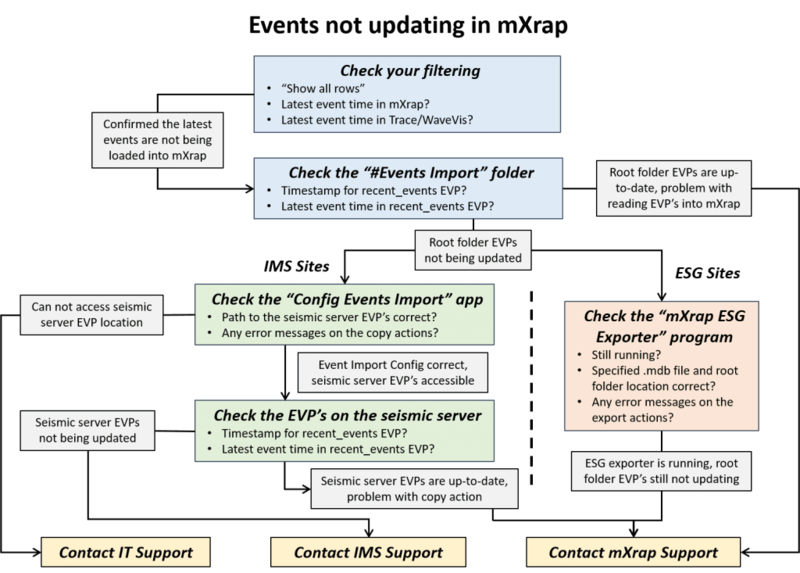 The flowchart below summarises the troubleshooting process when your events are not updating in mXrap (PDF version).